Posted 5/17/2018 2:46pm by Patti Rosenberg. 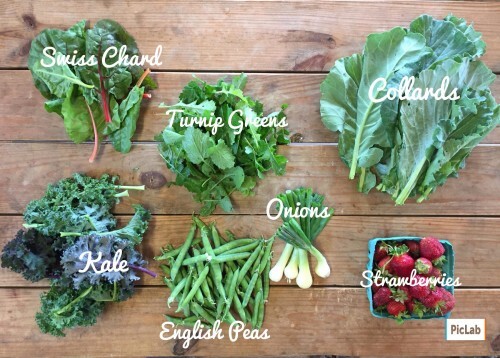 This week’s CSA share is for weekly members only. It is understandable I f you are a bit confused about who is writing the newsletter from week to week. This week it’s Patti. Dear Liz had a last minute family emergency. She has been so gracious to write our email for me this year, since Stuart and I are doing a bit of healthcare consulting this year in Chicago and New York. I won’t bore you with the details, but thought I’d at least try to clear up any confusion. Strawberries - these beauties are going strong and we have plenty so let us know if you want more, otherwise, we may turn them into jam for you! English Peas - peas are hard to grow and like many vegetables, some years are better than others. This year was good! 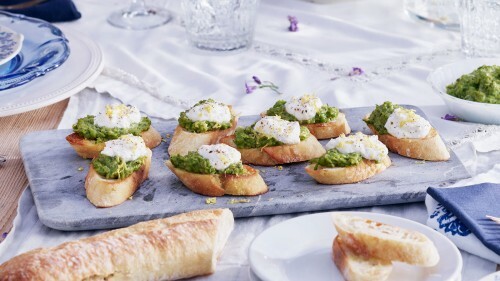 Try thus yummy Pea Crostini with lemon ricotta, or just blanch them and add them to pasta, salads or as a side dish. English Peas are best out of he shell and barely cooked. Kale - kale should be chopped finely and cooked with a touch of water for longer than you would the more delicate greens of Spring. Our favorite recipe is Kale Chips! Something about roasting Kale in the oven that takes away the toughness and makes it super tender. Swiss Chard - such a lovely, sweet green that is tender enough for a salad in early Spring, and hardy enough for a savory compliment to shrimp and grits for roast chicken with mashed potatoes. Turnip Greens - are a bit spicy and perfect when added to any sautéed mixed greens recipe. Collards - sweet and tender, some people remove the stem and others chop it all finely and cook stem and greens together. Still others like to blanch collars leaves to make the best wraps, for a bread-free finger food. Onions - chop and sauté before adding greens and eggs for a perfect omelette. There are so many uses for onions. Grilling Spring Onion is one of my favorite ways to enjoy them. Steaks - be sure to thaw these in your refrigerator for 5 days before marinading and cooking them as you would your favorite steaks. And please cook them just a bit lower temp for best results. Fresh grass-fed beef cooks about 25% faster than store-bought beef so check it early and often!